As I move through the long painful process of my unwanted and unasked for divorce, my husband and his sister have decided to use money as a tool to hurt and distract me from the truly important things in life, God and my young family here in Colorado. I daily dodge the minefields that seem to be around every corner, thanks to Satan leading their collective efforts. However I am also reminded each day of how beautiful and simple life can be when walking with God in your life. Just on Friday, my son invited me along on a field trip with my granddaughter and her other loving grandparents. 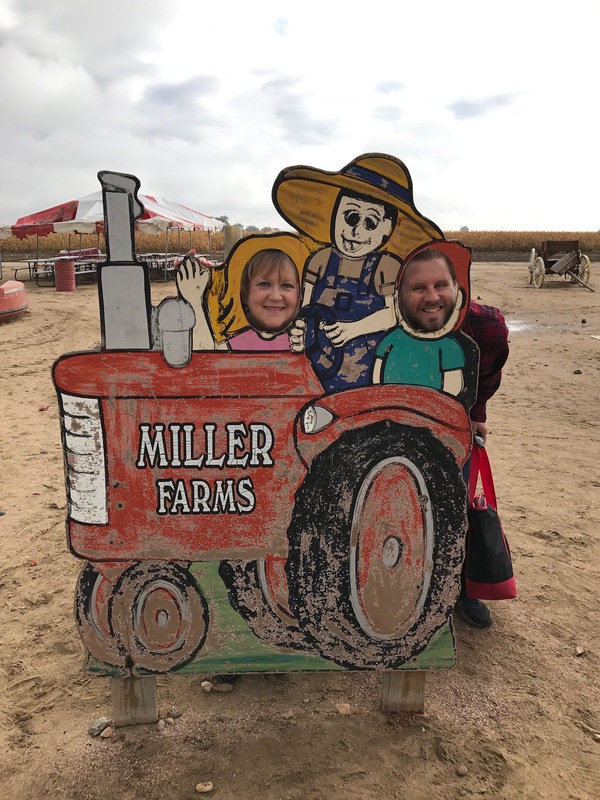 We went to Miller Farms in Plattville, about 30 minutes away. 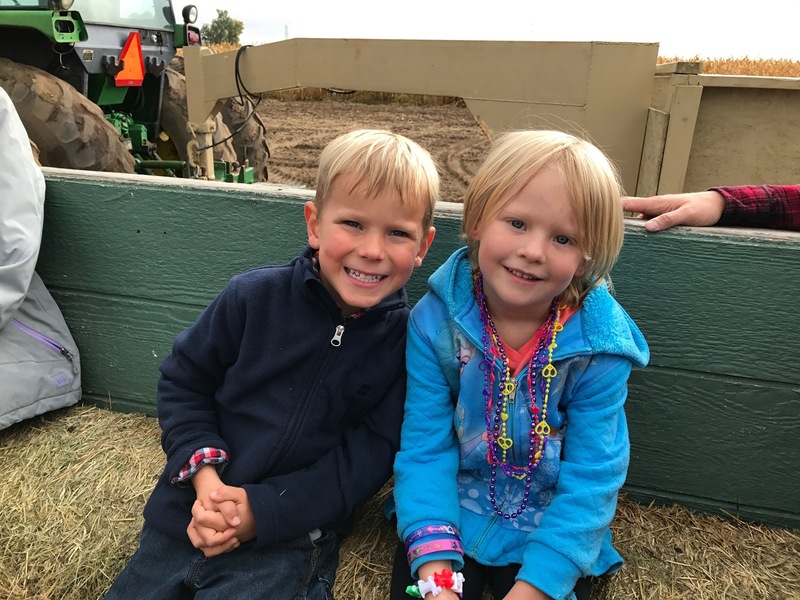 Hundreds of young school children with their parents and grandparents, rode out into the plentiful fields on huge long flatbed trucks lined with bales of straw to sit on. I did not come prepared with anything, I had never done this before. We climbed down from the trucks with help from my tall quiet son and quietly walked through the fields filled with harvest vegetables. We used our hands to dig through the silty soil to carefully pull up the slender carrots growing deep in the soil, getting dirt under my nails. We excitedly circled around and scooped up the freshly tilled potatoes, full of moisture and goodness. 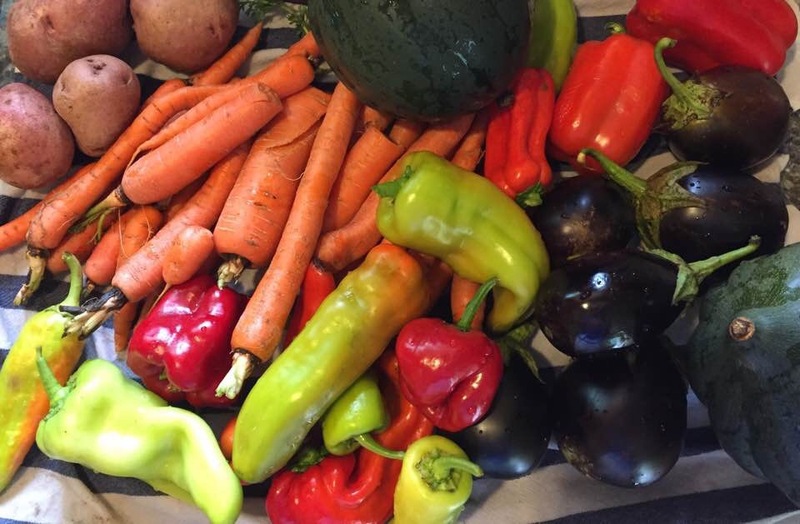 There were miles of crimson and green peppers and tiny purple eggplants growing on bushes, and orange and green acorn squash and gourds growing on thick winding vines. There were mounds and mounds of small orange pie pumpkins that my granddaughter carefully wove through. Each stop along the way led to a treasure trove of colors and smells of God’s abundance for us. There were tall stalks of corn and bushes loaded with green beans, and rows of cabbage that looked like gigantic purple and green flowers. There were rows of sweet onions peeking out of the ground and huge stalks of leafy celery along with the smell of fresh basil wafting through the air. I never knew how any of these beautiful vegetables grew until then. It was a special day for all of us, especially as I helped my granddaughter in her quest for the two tiny gourds with absolutely no soil on them. She wanted total perfection for the brilliant orange pumpkins that she would be taking home for she and her brother to put on their front porch. I looked at the innocent face of my granddaughter as she sat next to her beaming friend Abe. It is such a blessing from God that her parents and maternal grandparents and I are all alive and have pledged to keep her safe and far away from the evil of life. She will one day have to face what life throws in her path, but goodness and light surround she and her brother thanks to the love and protection of her family. Exactly what every young child deserves in life from their parents and grandparents. Is there anything more special than the love of a grandchild? Can money even begin to compare to that child’s life? I would give everything I have away in a second to protect and surround my grandchildren with my love. But there are people in our world who choose their careers and money over the lives of their children and grandchildren. Or is it fear that keeps them from fully loving their family? Is it their lack of faith guiding their lives? Do they not truly believe that God has a plan for each one of us?Without faith and belief in God, we are left in darkness and surrounded by a world filled with hate and intolerance for others. I choose to not let money rule or ruin my life. If there is anything left over after this horrible thing called divorce, half will go into my new non-profit organization called The AM Global Initiative in addition to half my earnings going forward from my Strategic Visioning coaching. The A stands for Aden and the M stands for Maggie. My life, my sweet little loves forever. Thank God for their wonderful parents who will never let anything or anyone hurt them. 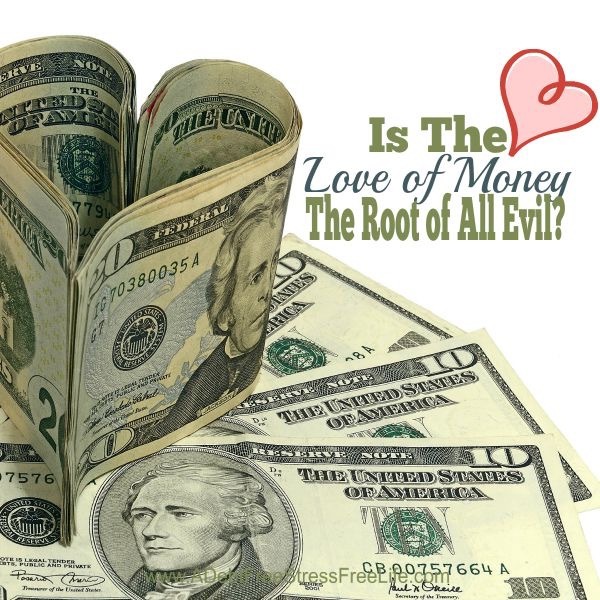 Hebrews 13:5-6 – Keep your lives free from the love of money, and be satisfied with what you have. For God has said, “I will never leave you; I will never abandon you.” Let us be bold, then, and say, “The Lord is my helper, I will not be afraid. What can anyone do to me? Take that Divorce. I will not be defeated thanks to having God as my partner in life and in death. Previous Life is Amazing. Life is Awful. Next Does Facebook Kill Relationships?